The Marina Bay circuit is probably the most unique venue of the 2013 Formula 1 calendar. Hosting 23 challenging slow-speed corners punishes the rear tyres for traction. In fact, it isn’t just the tyres that are under extreme conditions beneath the Singapore lights. Let’s look at some quick figures: 21% of the lap is spent on the brake pedal with a total of 16 braking zones; only 45.5% of the lap is on full throttle; the straights are relatively short, with the cars reaching a lowly 190 mph with DRS activated (or if you’re in a Red Bull, 184 mph); humidity lingers at around 85% and air temperatures are around 30 degrees Celsius. So with all this to contend with, it is the brakes that are in for the biggest thrashing. Teams will bring larger brake duct inlets to cope with this, although the disc temperatures will never get a chance to get back to their best operating window. This is due to the short straights that do not allow enough air to pass through the brake assembly before reaching the next corner. We have seen a fair share of brake failures over the past five years and it would not surprise me if we saw another this weekend. The fuel effect is also high – for every 10 kg of fuel there is a laptime penalty of around 0.4 seconds. This is partly due to the long laptime. Sebastian Vettel’s pole time may have been 3.521 seconds quicker than last year’s pole time from Lewis Hamilton, it still takes well over 100 seconds to get round the 3.152 mile track. On the subject of fuel, consumption is also higher than average due to the circuit being at sea level. The resulting higher pressure and dense air burns fuel slightly more than most tracks at 2.26 kg per lap. There were many items to test in this camp. Unlike a lot of teams, they spend most of FP1 and some of FP2 back-to-back testing components such as front wings and diffusers. It was surprising to see that they had brought the same wing from Spa, featuring the trimmed flaps. It had some slight alterations: of the 7 elements that make up the wing’s profile, 2 of the members have been stretched across the entire span of the wing rather than being aligned along the outboard section. This now means that 5 of the elements span across the entire permitted area of the front wing. They have also followed the tyre monitoring IR cameras that Mercedes use on their front wing, although they place their sensors on the trailing edge of the last element on the wing rather than on one of the winglets. 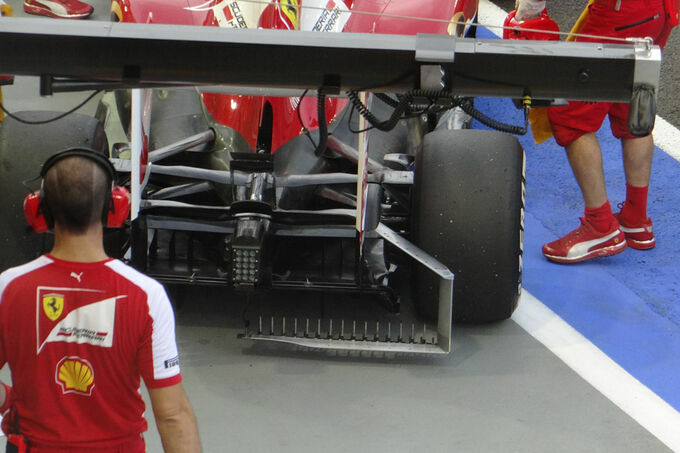 Ferrari were also testing a new rear diffuser on Friday although I cannot confirm that it is being raced this weekend. It features the rapid out-sweeping design that Mercedes have adopted along with Red Bull recently. This design expands the flow outwards more aggressively as well as upwards, which means that the low pressure flow beneath the car is leaving faster and therefore pushing the car downwards. This version was tested in Belgium but was not raced. They used a variety of rakes on the car to see how the airflow was behaving both before the air entered beneath the floor and as it was passing out of the diffuser. The Maranello squad continued to switch between a two versions of nosecone – one with the chin, one without. Front and rear brake ducts were also updates, featuring more vanes to guide airflow more efficiently and to generate local downforce upon the wheel. There also appeared to be a small bump along the sidepods before the exhaust trough exit. 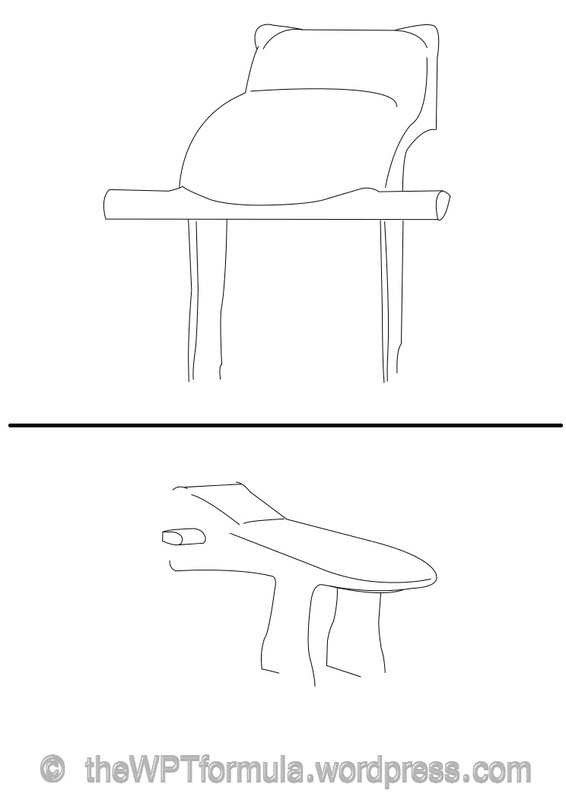 I am not entirely sure why it is there but I will seek clarification. In addition to the differing chin layouts, both drivers opted for a change beneath the front of the chassis. 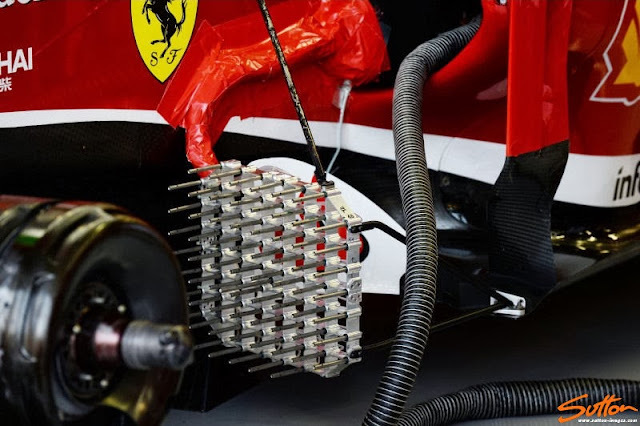 Fernando Alonso chose a three tier turning vane whereas Felipe Massa went for a two tier arrangement. This will control the airflow downstream from beneath the nosecone a bit differently, diverting it to slightly different areas around the leading edge of the sidepod. Overall then the small updates Ferrari have brought with them appear to be the final parts that will feature consistently on the car for the last segment of the season. Following Williams, McLaren have an additional Vortex Generator (VG) fence on top of each sidepod, equating to 8 in total – 4 each side. The extra VG was abandoned for qualifying and race, however. The addition of a VG fence is to literally generate a small vortex: this is achieved by allowing airflow to pass either side of the fence, converging at the end at two different speeds to create an oscillation. This small torrent of flow aids the guidance of airflow over the top of the sidepods and over the exhaust plume to further improve downforce at the rear of the car. The larger the length of the fence, the greater the size of the vortex produced. These fences also have a specific height to achieve vortex generation at varying speeds. McLaren’s examples above are relatively low and work at their best at high speed. There was also a revised Y75 (Monkey Seat) winglet, featuring an additional element to boost downforce on top of the beam wing. This works in conjunction with their latest beam wing introduced initially in Spa. This combination should help work the diffuser’s central section and rear wing a bit harder in the process as each of their airflow structures interact with eachother as they exit the rear of the car. Adrian Newey continues to make his presence known by strolling the garage once again in Singapore, which can only mean that he is still inspecting and improving development parts on the RB9. It is only when Newey fails to appear at a Grand Prix that we know that the RB9 will not be receiving more extensive modifications. Red Bull tend to change their nosecone layout between different types of circuits and here in Singapore was no exception. They have reverted back to the nose we are most accustomed to seeing (top) for this higher downforce track. It features the camera pods mounted at the tip of the nose, generating a small amount of downforce right at the front of the car, with the nose itself being slightly lower than its counterpart (bottom). 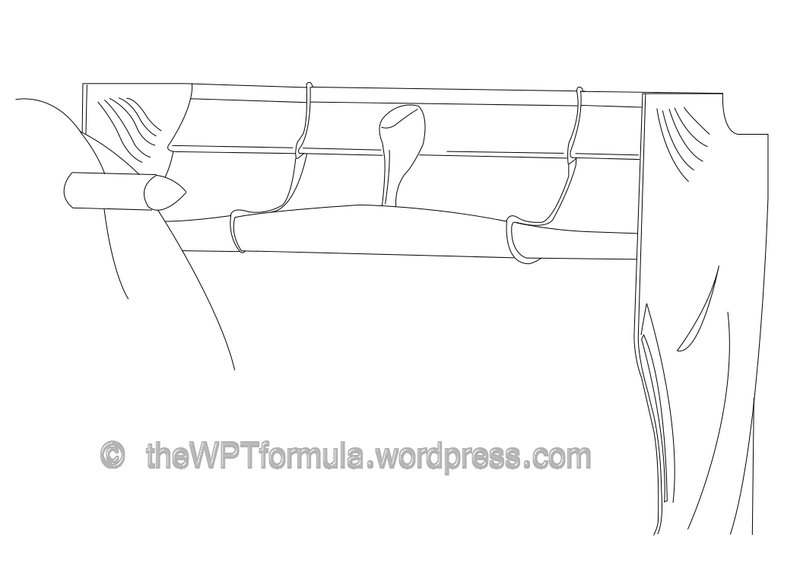 The latter wing is traditionally used at lower downforce circuits and has featured in both Spa and Monza. The camera pods are placed further back to aid airflow around the suspension arms more efficiently, reducing drag. Sebastian Vettel was using a slightly higher downforce rear wing on Friday, featuring a higher Angle of Attack (AoA) than his teammate, Mark Webber. The German driver then reverted back to the slightly lower AoA wing, probably to aid the balance of the car rather than pure performance. Both RB9’s were at least 10 kph slower through the speed trap than its main competition although this never seems to concern them, probably because they can’t do anything about it. Every team is running as much downforce as possible here – there is no compromise (if we take out the cooling inlets and outlets, which cause drag). It is a pure testament to how much downforce the RB9 is producing in comparison to its nearest challenger in the Mercedes W04. The Mercedes engine may be slightly stronger than the Red Bull’s Renault power, but it is not 10 kph. On Friday, one RB9 was equipped with a modified diffuser although it was not drastically different to the one seen at the previous few races. Its outer walls had been lowered slightly and the gurney flap lining the top of the diffuser followed its curvature right to the very edge (see here – http://3.bp.blogspot.com/-asDO2rciKo4/UjxvbFJ3gyI/AAAAAAAAITc/iphWQSqTrkk/s640/dpl1320se070+(Custom).jpg). This altered design should be aiding the expansion of the airflow beneath the car although I am unsure if it was used in qualifying and therefore the race on Sunday. On a side note, when Webber grazed the wall during FP2, the Red Bull mechanics got the car back to the garage and examined the suspension arms, driveshaft and track rod components. It was a fair clout so they decided to not only check it visually but also with the help of an ultrasound machine. The ultrasound can detect hairline cracks in any part of the suspension assembly so the team know whether to replace it or not. Neat bit of kit. Introduced in Hungary, the Mercedes front wing featured its small canard fins tucked in just behind the main cascades. For Singapore they received a slightly new touch by passing the trailing edge of each fin downwards at 90 degrees, attaching to the wing profile itself. 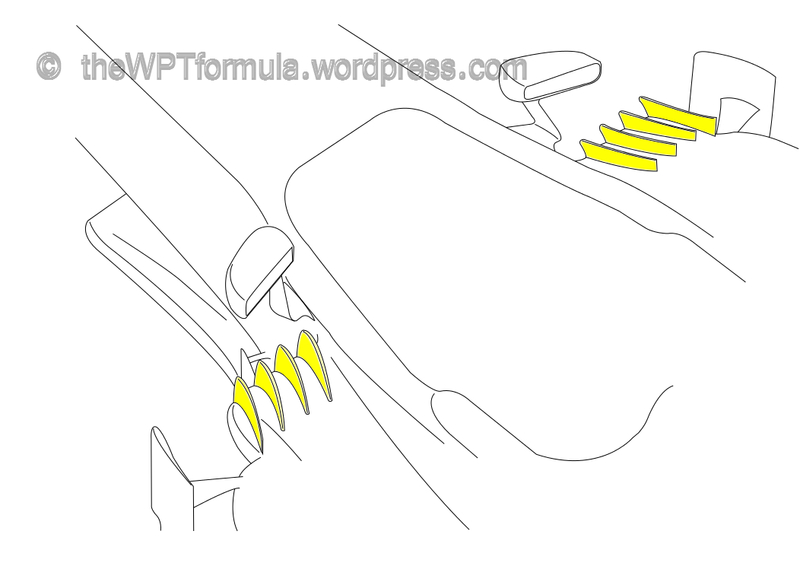 This acts as an extension to the main cascade as a method of managing the airflow around the front tyres. The undernose pelican bulge – taken off for the low downforce circuits in Belgium and Italy – reappeared to provide the front end with a bit of extra grip. Interestingly, the E21 was not installed with its long wheelbase for this weekend. The change in length is aimed at controlling weight shift, according to trackside operations director of Lotus, Alan Permane. “The main weak point of our car is combined turn-in and braking. “The problem is when we cure it we then have too much mid-corner understeer”. Lotus want to use it at the next race in Korea, which features more mid-to-high speed corners allowing the longer layout to be more suitably applied. Finally, the STR8 featured a new high downforce rear wing. The central section has been lipped at the leading edge to encourage more airflow to pass beneath. The DRS actuator pod is also new, forming a ‘golf club’ shape. The endplates have remained the same and still include the very long, vertical tyre wake slot aimed at reducing the effects of tyre squirt upon the rear wing. Some very complex rear brake ducts were also on the car for the entire duration of the weekend and the sidepods/exhaust area was given a a few tweaks to extract hot air from within the car more efficiently. Thankyou for reading this article and please continue to visit my website for all the latest technical news in Formula 1. I have also been writing for another website lately but taking a slightly different approach. My articles still have a technical base but it is much more detailed and considers all things F1. 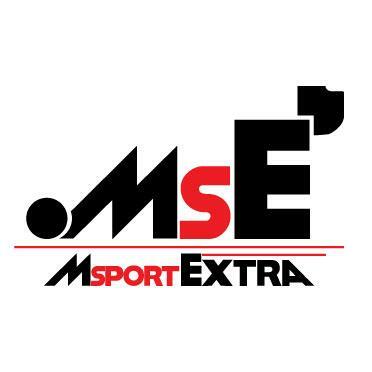 Please visit wheels.morethanafan.net and follow them on Twitter for all things motorsport! 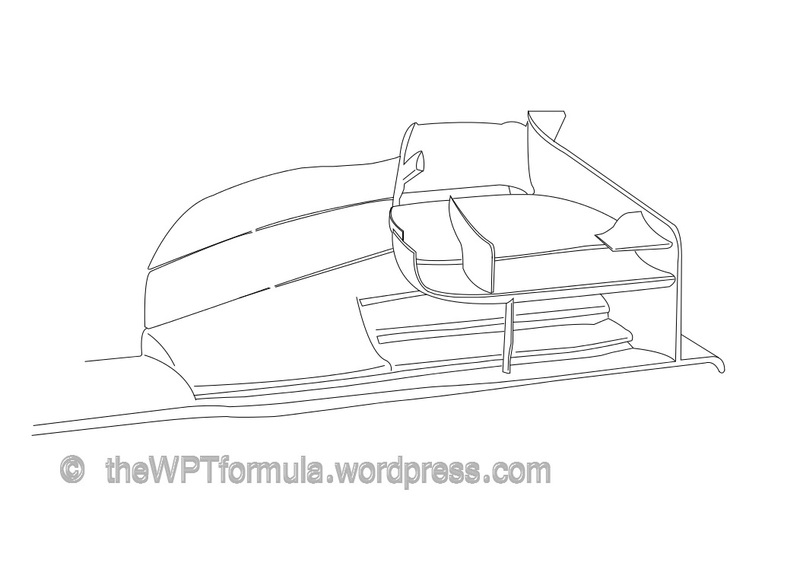 This entry was posted in 2013 Highlights, Technical Highlights and tagged 2013, f1, singapore, tech highlights, updates on September 21, 2013 by thewptformula.